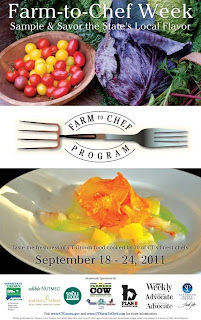 This week is Connecticut Farm-to-Chef Week, sponsored by the state Department of Agriculture's Farm-to-Chef Program. According to the website, "seventy restaurants, caterers, institutions, schools, farms, wineries, and other dining venues throughout the state have signed up to create their own special Farm-to-Chef menu showcasing Connecticut Grown ingredients and Connecticut wines" throughout this week. We enjoyed a fabulous dining experience at Farm-to-Chef Week participant Peppercorn's Grill on Main Street in Hartford for a (bargain!) prix fix of $29.50 (before 6 p.m.) or $37 (after 6). The three-course meal featured end-of-summer favorites such as stone fruits, corn, shellfish, greens, cheeses and more. Here are some photos and descriptions of our meal. If you haven't gotten out there to savor CT's best proteins and produce, do so before the celebration ends! Saturday, September 24th is the last night to indulge! sauteed rapini greens from our own garden. served with heirloom potatoes and a "misticanza" of fresh field greens and fresh herbs. potatoes from GeoRoots Solar Growth Farm, Canton CT.
in a sweet basil scented "soup". I love events like this. I wish I was in town to sample it. Your dinner looks delicious!